Most vignettes in our home are created with vintage items, handmade creations and a bit of memory making. I make changes for each season and holiday….and whenever I feel a need for an update. Our snowman friends will greet you at the door when you enter our home with a happy Welcome! I purchased the snowman a few years ago at an after holiday sale, they were a prop in a country store display. I have blogged about the green table previously, this table has changed ‘greens’ 3 different times and has moved to 2 different places until it found its home. I also hand painted each and every brick in this photo, but that is a story within itself, I will be sure to share at a later date! Vintage and a memory maker….the ornaments are my husband’s grandmothers, shiny and brite as she was…miss her. I even have the original boxes, how sweet she was to give them to us our first Christmas together 28 years ago…. These glass cloches, compass, alarm clock and boxwood wreath have remained the same as in my Autumn Vignette (here). I added glittered pinecones, velvet ribbon and ironstone with gold leaves for Christmas. The gold in the pinecones, leaves, clock and compass all coordinate, the ribbon adds a bit of the unexpected Red. And the cradle….I am sure this will show up in many vignettes I just love its chippy paint and it was worth slopping thru a rain storm to find it! Adorned with simple greens, white pitchers and berries. I like to also add holiday touches to our iron chandelier…these are glass beads from my husband’s grandmother….still full of glitz! ….wouldn’t this photo make a fun Christmas Card? The wood bowls are soap dishes from my early days at Bath & Body Works, the linens are a vintage find and the Santa mug was painted by a creative friend, Charlotte Fritz. I considered collecting Vintage Santa Mugs….and have a few saved in my Etsy shopping cart for the day I decide to do it! Next, a Santa bank with a silver coin tucked in side…..This was the last vignette to be created, Santa needed a home he was the last in the box, I had 1 more piece of greenery and 1 leftover strand of glass beads….no décor left behind! …and just for fun, a spool of velvet ribbon and bells….such pretty pantina and oh – my – word the sound…..so delicate and pretty! I found these at an outdoor flea market, how could I have passed by this treasure ? Adding Holiday touches does not need to be expensive or from a big box store. Be creative and original, search vintage shops or your grandmothers attic, use ribbon from last years Christmas gifts, greens and pinecones from nature, glitter and glue from your craft stash, or add a Christmas photo from years past. I have even used the backs of cereal boxes to create ornaments to adorn garland! 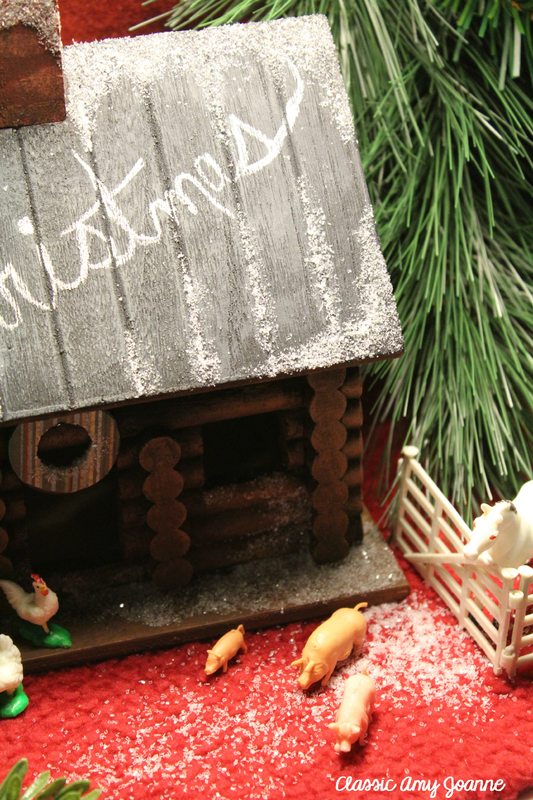 Visit last weeks blog post (here)….creating and setting up a log-cabin vignette. Each year I use the same Christmas Décor like the S&P Shakers (or P&S as shown!) (here), just in a different arrangements, with a few new handmade or vintage finds or placed in a different room or shelf. It keeps it fresh, inviting and new. How do you keep your Holiday Décor fresh, inviting and new each year? for the record….what you are seeing is little snippets of a fun filled artful life, what you are not seeing is, my life is just as crazy and messy as anyone else….if I would have turned the camera around you would have seen my husbands socks on the floor from just arriving home from minor surgery; the furniture re-arranged, rugs covering the floor and coolers lined up waiting on a new fridge delivery; laundry piled high, mail and mini ‘to-do’ piles on any flat surface….and so on. We are all in this together. But sharing the pretty is so much more fun! I love setting up vignettes throughout my home year around. Like you I love a mix of handmade, vintage finds, items passed down from generations. I love giving my home a look and feel of warm and cozy. Merry Christmas Amy! Thanks for sharing Lynn, We have ALOT in common….I look forward to your blog posts of your beautiful home, your paintings and your sentiment! Love everything about this post especially the last paragraph. I think that is truly most of our lives. The perfect pretty picture let us escape to a happy place that that we can pretend we live in everyday. Love all the pretty vingettes. Merry Christmas my friend!